Before popping off for weekend breaks, check out these Bank Holiday beauty sales and bag a bargain before you go. These brands normally have very affordable prices but with the Bank Holiday offers, it would be wrong not to indulge! 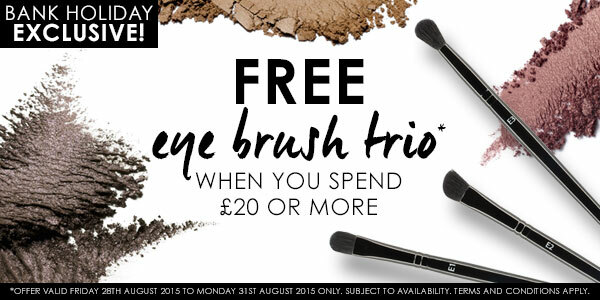 Free gift@ Brush Trio when you spend £20. MUA Luxe – Velvet Lip Lacquers, non-drying, and super-long-lasting. I have them in almost every shade. They also sell them as a full set. MUA Make-up Fixing Spray, I haven’t tried the matte version yet but the regular formula was reviewed here Fixing/ finishing sprays… who is the fairest of them all? MUA highlighters, I’ve tried all but the new shimmer sticks and they’re great for giving a little glow under the foundation base or a fuller highlight used over foundation. The Dew pots are really lovely on the eyes and are now just £5.50 (previously £7.25). For a rundown of what I liked about them, here’s my review. Whatever you’re up to this weekend, enjoy! Leave a reply on "Bank Holiday budget beauty sales"